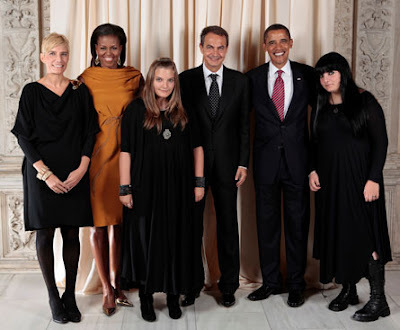 Yup, that's St Barack, and that's the Spanish PM, and those are his children. His totally, all out Goth-rocking progeny. As teenage Spaniards it is their duty (their DUTY I tell you) to dress this way. Next year they'll be taking a world tour of Goth heritage sites as part of a cultural exchange. They will bring delicious tapas and backpacks with cuddly bears on the zips, and we'll flog them dodgy bangles from Camden Market that make your skin go green. Great photo but Spains on a mission to get this photo removed from the internet. I've been reading the comments on a number of web articles about the picture and I think the treatment of these girls is positively ridiculous. With all the outcry the public was making you would think the girls has shown up in thigh high boots and a pvc mini when in reality they are well covered in tasteful long black dresses. I simply don't understand society sometimes. My first thought was 'this a photoshop job, surely?' I actually love the expression on her face, it's like she can't quite believe it herself. Being a Goth in Spain though, with all that sunlight... Sheesh. They look so precious! And their gothy mom looks proud too haha. To be clear, Spain has a law protecting the publication of information about minors, including their photo, without parental consent. So the Spanish attempts to remove the photo have nothing to do with these particular kids, but rather with constitutional law. wow i didn't realize there was such a scandal! they're dressed much more modestly than most girls who are in the public eye. oh...after reading that article i see why they're trying to remove it. TOTALLY WONDERFUL!! Glad to see it before it gets yanked down. sware to god that now i really like the spanish president!!! he has two goths daughters and doesnt pretend they dress "good" for some important picture. Dig that, Anon, he's a chill poppa for sure. He's hilarious, too... look up his various gaffes for some good laughs sometime. The awkward slouches make me want to cuddle them and give them some leafy greens. Considering the custom of basically NEVER allowing news photography of political families in Spain, I wonder if maybe the daughters specifically requested to have a picture with the Obamas. They are VERY popular with young people aroung the globe. I mean, my man Barry (Barack for all you non-yankees) is right on the verge of producing Micheal Jackson-esque hordes of screaming, hysterical...what did you call them, tottys? PM for Prime Minister, or night time? A good combo. Miranda, I don't think she is. The photographer probably told her to move in a litle bit so that she woudln't get cut out of the picture. B/c they are both wearing black you can't see that there is a distance between them. that is my guess anyways. The scandal came from Spanish laws that forbid child images in public media without their parents consent but the photo came out elsewhere. Also we laughed a lot at them because they look just like a pair of tables in front of the group. I thought they were wax sculptures because they are so shiny. Also, does the one with the Wiccan necklace on have scoliosis or something? I say it's the mother's fault. I mean, just look at her.